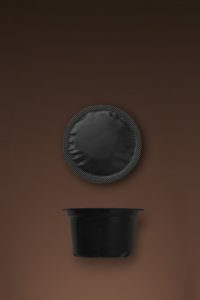 By using our coffee capsules, you can now enjoy the flavor and fragrance of a fresh roast with its intense aroma and timeless intact flavor right in your cup. 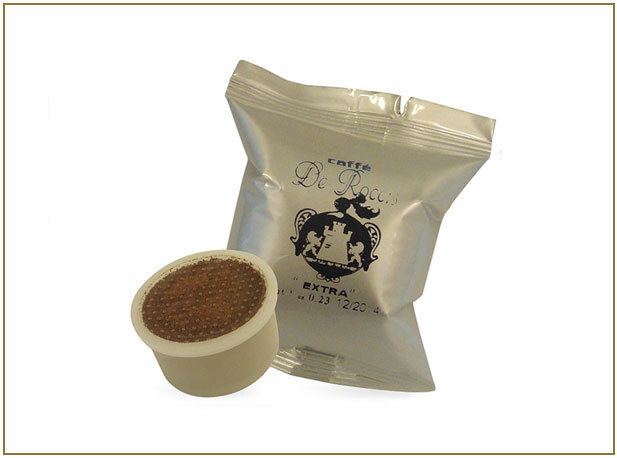 Our coffee capsules are designed to give you the perfect cup of espresso at home or at work. Our coffee capsules and pods vacuum ground and packed in single-dose capsules maintains all its fragrance and aroma in time. We offer a wide range of select blends to quench your coffee craving any time of the day. 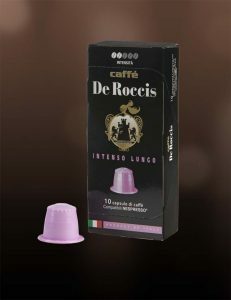 Our coffee capsules and pods are a simple and fast way of getting good espresso with the same creamy texture and fragrance you would get from your favorite barista. The coffee products distributed by De Roccis are reliable and consistent. They are designed to meet the demands of a wide audience. 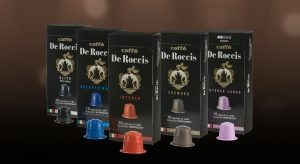 “De Roccis” coffee capsules compatible with “Nespresso” machines born from the careful selection of high quality coffees from Central and South America, India and Africa roasted to perfection. 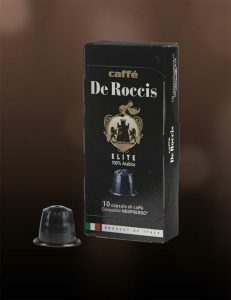 The result is De Roccis ELITE: a perfect espresso, delicate, aromatic and smooth ideal for sophisticated and demanding coffee lovers. 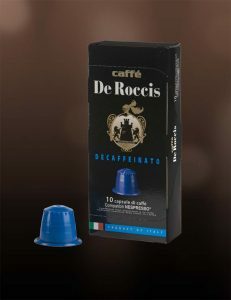 “De Roccis” coffee capsules, compatible with “Nespresso” machines, born from the careful selection of high quality coffees from South America, India and Africa roasted to perfection. 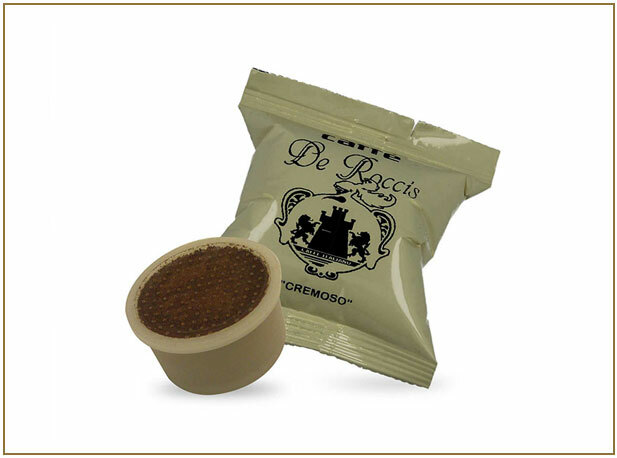 The result is De Roccis INTENSO: an espresso with rich and creamy flavor. A blend of the best coffees from Central America, Brazil, India and Indonesia. Its smooth flavor is the perfect combination of sweetness and energy. 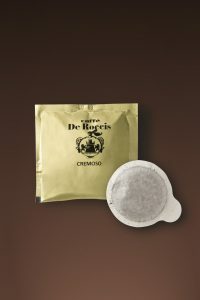 An accurate selection of high quality coffees from Central and South America, India and Africa roasted to perfection yields the De Roccis CREMOSO espresso. An extraordinary mild and smooth blend with a strong and yet delicate finish. 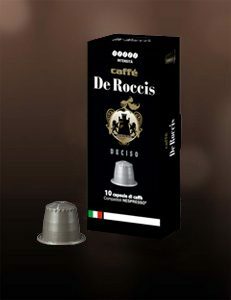 “De Roccis” coffee capsules compatible with “Nespresso” machines born from the careful selection of high quality coffees from Central and South America – 50% Arabica. These are coffee capsules made with selected coffees from Central and South America and from India. A blend with an intense fragrance and full-flavoured aroma. A mild and smooth taste of selected Arabica and Robusta coffees. 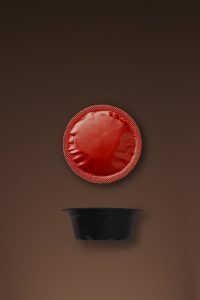 Long lasting and velvet aftertaste. 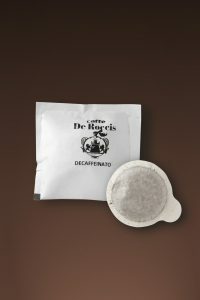 A range of fine coffees for 5 unique blends. * Nespresso is a registered trademark and property of SOCIETE ‘DES PRODUITS NESTLE’ S.A.
High quality blend of the best Arabica varieties, slow roasted to enhance the natural rich aroma and fragrance. The result is a sweet and light coffee with a wonderful fruity finish. Coffee with a distinctive and vigorous flavor, full and creamy and with a pleasant finish. This is the right coffee for a unique sensory experience. Smooth coffee with a full and round flavor and enjoyable finish. Its very rich crema is typical of the quintessential Italian Espresso. 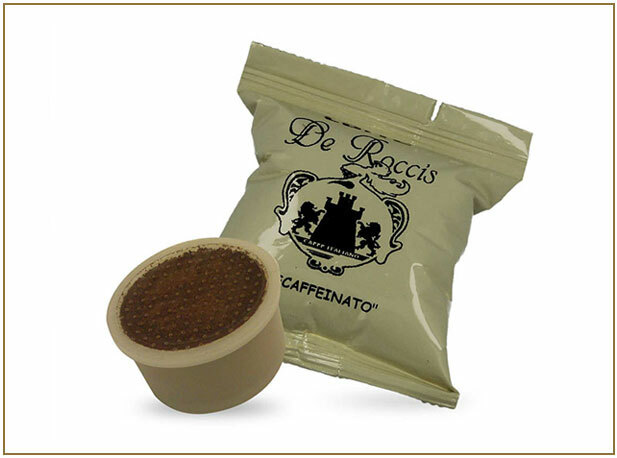 Low caffeine content Espresso with an extraordinary, balanced and all embracing flavor. Milk and coffee: a happy Italian mix for the most popular hot drink in the world. Creamy and dense, a real cappuccino as in the bar. Coffee enriched with the soft creamy texture of milk to offer an enjoyable alternative to traditional espresso. 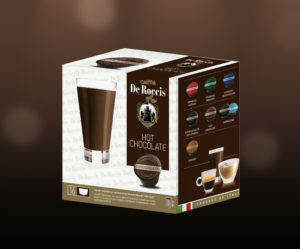 A drink that truly tastes like chocolate – a simple and fast way of having a nice hot cup of delicious hot cocoa. 100% Arabica for a sweet and well balanced coffee with rich aroma. Distinctive and strong roast to charge you with positive energy when you start the day and keep you going strong all day long. A MUST if you want to enjoy true Italian espresso. Delicate and balanced blend for a moment of total relax. Superior mixture, which highlights from the first inkling all its extraordinary ability to offer exclusive coffee sweet and aromatic aftertaste. A coffee mild but persistent aroma,taste rich, chocolaty with pleasant hints and tropical fruit. 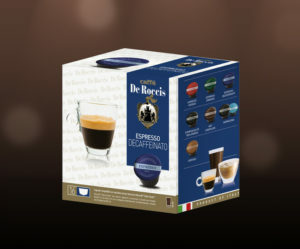 A mixture composed of precious varieties of robust and carefully selected and roasted arabica, to offer a remarkable coffee substance and body. An intense aroma, strong and sweet flavor on the palate, able to give a pleasant and persistent aftertaste. 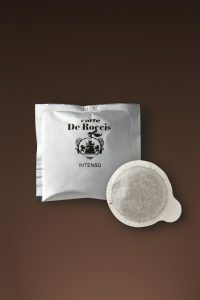 A proprietary blend, designed to satisfy the needs of those who for a cup of coffee you expect the best:intense and velvety cream, soft aftertaste, strong aroma and full flavor. A perfect harmony, to be tasted at home, at any time, the best espresso bar. A clever mix of Arabica and Robusta from the best crops in the world, the decaffeination through rigorous processes cutting edge, make this mixture is the right balance between the desire for coffee and physical well-being. A unique coffee, intense aroma and rich and strong taste. Superior mixture, which highlights from the first inkling all its extraordinary ability to offer exclusive coffee sweet and aromatic aftertaste. A coffee mild but persistent aroma, taste rich, chocolaty with pleasant hints and tropical fruit. A proprietary blend, designed to satisfy the needs of those who for a cup of coffee you expect the best: intense and velvety cream, soft aftertaste, strong aroma and full flavor. 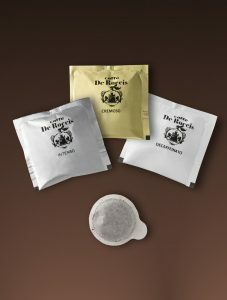 cutting edge, make this mixture is the right balance between the desire for coffee and physical well-being. A unique coffee, intense aroma and rich and strong taste. * “LAVAZZA, LAVAZZA BLUE AND LAVAZZA ESPRESSO POINT ” names are registered trademarks belonging to “Luigi Lavazza SpA”. De Roccis Srl. 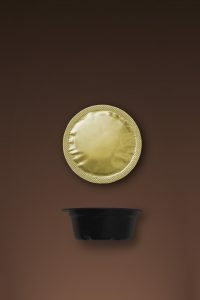 and its web site “www.caffederoccis.com” have no association with “Luigi Lavazza SpA”. 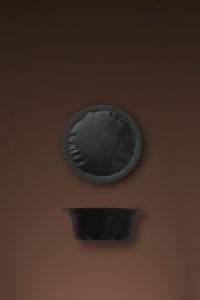 Designed for those looking to enjoy an espresso easy and quick to prepare: in each pod is contained the right amount of ground coffee to ensure an espresso in a workmanlike manner, at home and in bars.